enrich360 is applying a unique reverse logistics model that sees major commercial and industrial operators form a closed loop partnership to convert their food waste into compost. Bill Kollatos, enrich360 Founder and Director, could see the impact of farmer soil degradation from chemical fertilisers used as a result of mass production. With his team at In2food (previously Yarra Valley Farms), a leading wholesale supplier of quality fresh fruit and vegetables, Bill realised his vision to improve farmer products, consumer transparency and reduce the impact of food waste in landfill. Understanding that the future is determined by the health of planet and a need to support farmers – enrich360 was launched in 2016. To support its ambitious endeavours, the company received finance from Sustainability Victoria in late 2017. Enrich360’s program uses a dehydrator to condense food waste into recycled water and biomass that can be utilised as fertiliser. The model is established on a closed loop system where restaurants and cafes across the country convert their food waste into rich organic fertiliser to give back to farmers and grow better, more nutritious produce. Dean Turner, Chief Executive Officer of enrich360, says the company has seen significant growth since he took over earlier this year, having partnered with 300 businesses nationwide, including major organisations such as IKEA in Richmond and David Jones in Bourke Street, Melbourne. Dean says enrich360 will also soon be in other major outlets such as the Victorian State Library, shopping centres and a major airport. “We don’t proclaim to be a waste company, we don’t see ourselves as a competitor. We’re about our niche and supporting our customers that want to give back to the environment,” Dean explains. He explains that the company leverages a reverse logistics model by having In2food drivers pick up the condensed waste during their usual drop-off route. 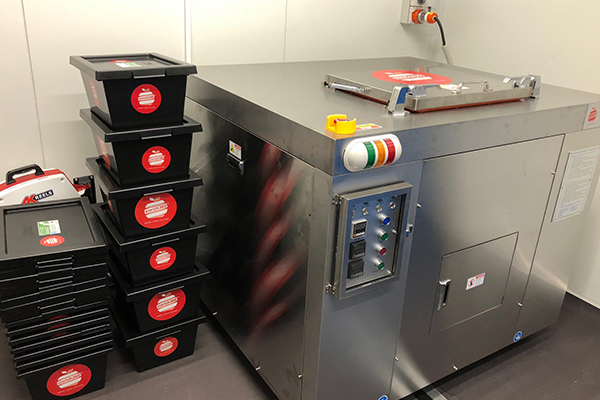 Dean says the food dehydrator is able to reduce the volume of food waste by up to 93 per cent. He says that on average, a commercial and industrial outlet such as IKEA produces about 200 kilograms of food waste a day, which can be reduced into two 22-litre bins comprising 15 to 20 kilograms of dry biomass and about 150 litres of water. The twice-weekly collection of sterile pathogen-free biomass is taken directly to a farm or composter for end use. “We’ve got machines that can do 30 kilograms of food waste which could run twice a day and up to one that does 1.1 tonne on the larger end, reducing the waste to just 100 kilograms – which significantly reduces trucks on the road,” Dean says. He says the company’s certification scheme will give consumers peace of mind that they are dining at a sustainable food service. The scheme requires partners to demonstrate compliance to the organisation’s program to be granted an enrich360 certification mark. “Getting the produce out of the farms and back into restaurants forms a complete circle. Once people are up and running and into the routine of that, we will go and check what they’re doing, make sure that they’re capturing all of their waste and then award them enrich360 certification,” Dean says. Once enough commercial partners are signed on, consumers will be able to use enrich360’s mobile app to ascertain where their raw materials are coming from and information on the farm – adding a further layer of traceability to the process.